Chef Dimitrios hit 'The Maine Event' dinner out of the park with a six courses meal full of extremely well executed and beautifully plated dishes. 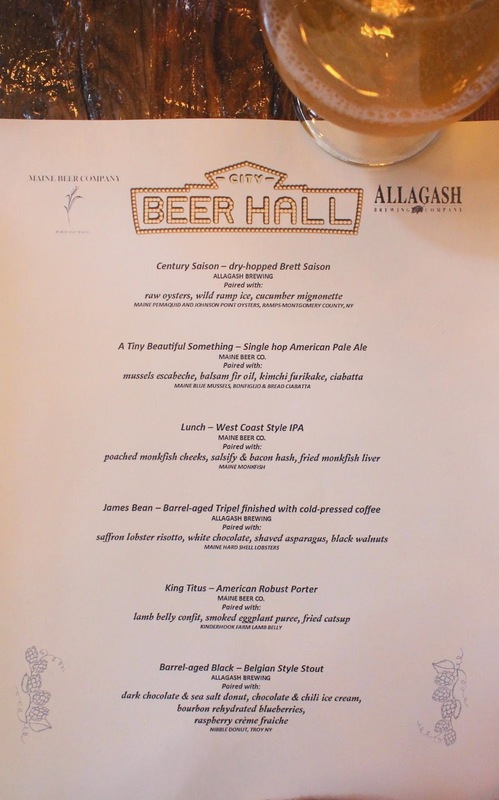 Each course was paired with a beer from either Allagash Brewing or Maine Beer Co. 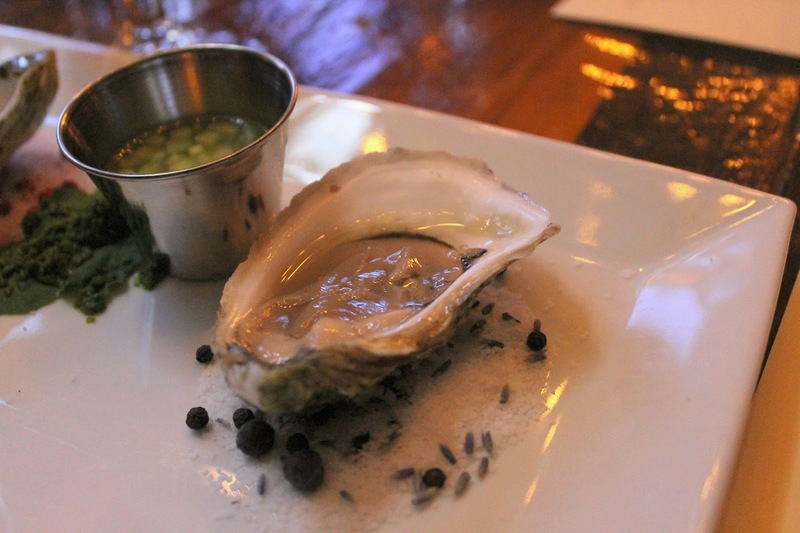 The evening started off with one of my favorite treats ever: oysters! 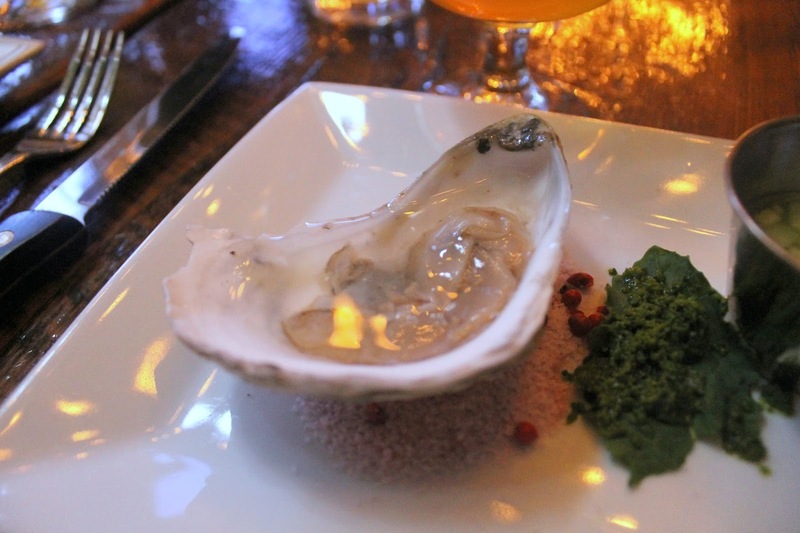 We were given a plate with one Maine Pemaquid Oyster and one Johnson Point Oyster, accompanied by a cucumber mignonette and wild ramp ice. 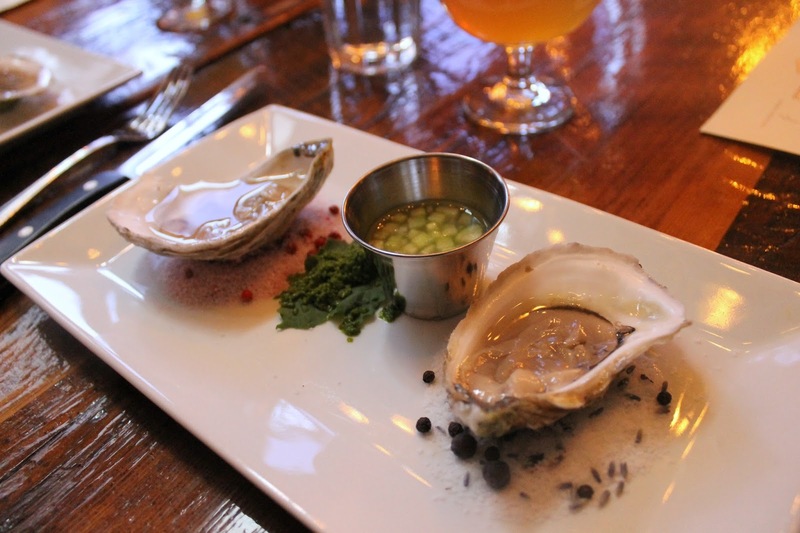 The oysters were shucked to perfection and super refreshing when paired with the Century Saison (dry hopped Brett Saison) from Allagash. 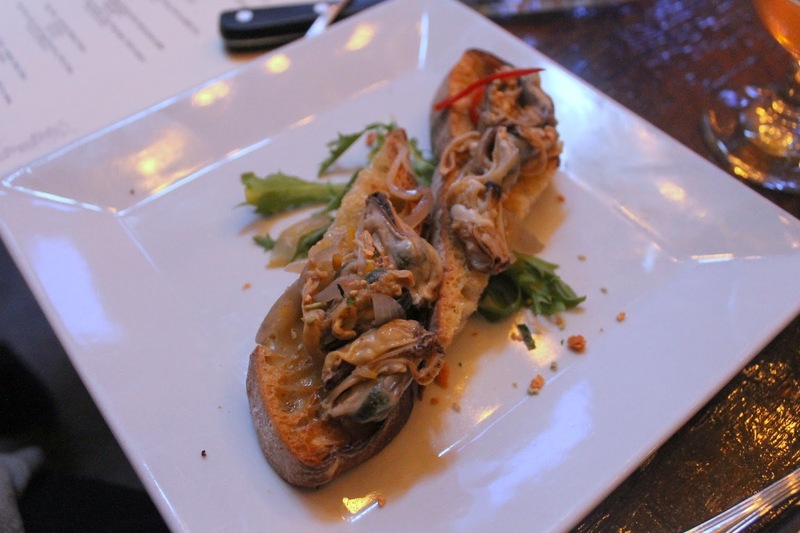 Second Course: Mussels escabeche with balsam fir oil and kimchi furikake on ciabatta from Bonfiglio & Bread. 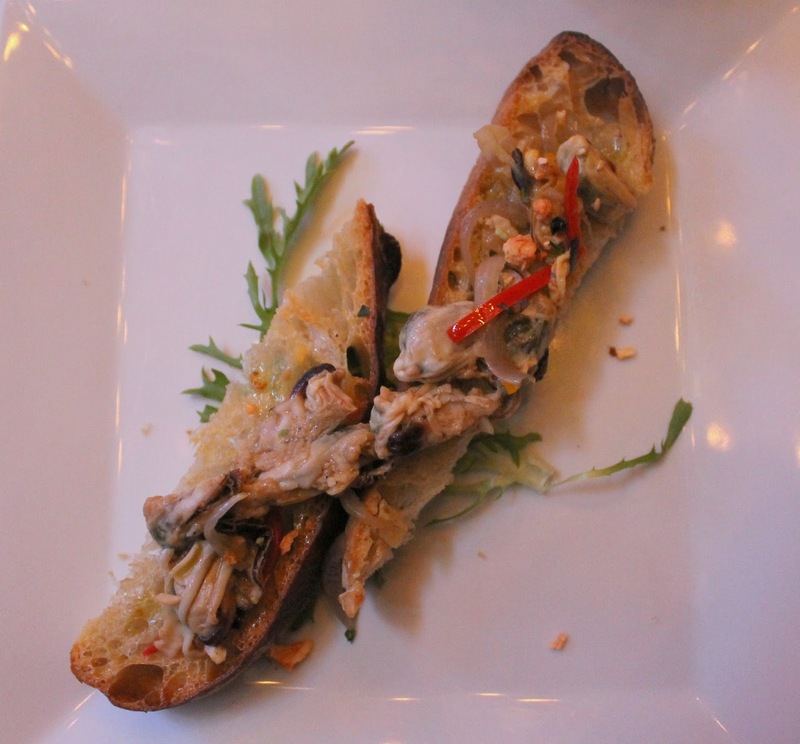 The flavor combination of this dish was spectacular. 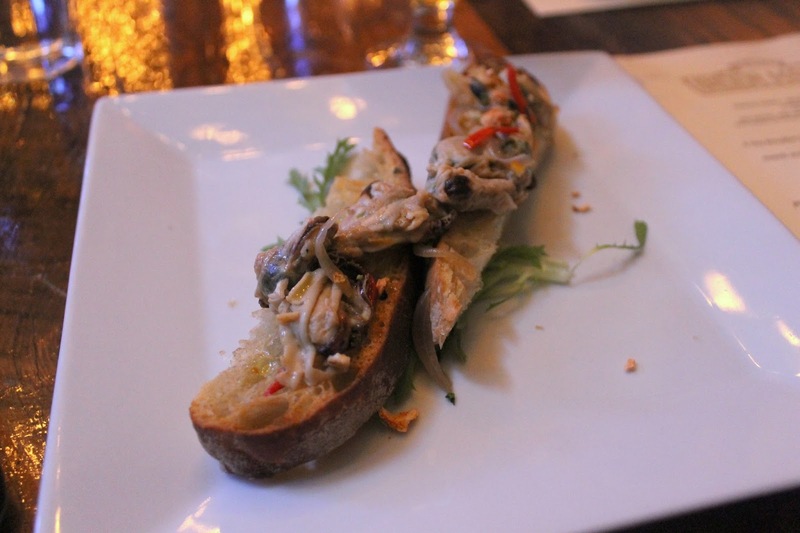 I think cold mussels are going to become a new staple for me! 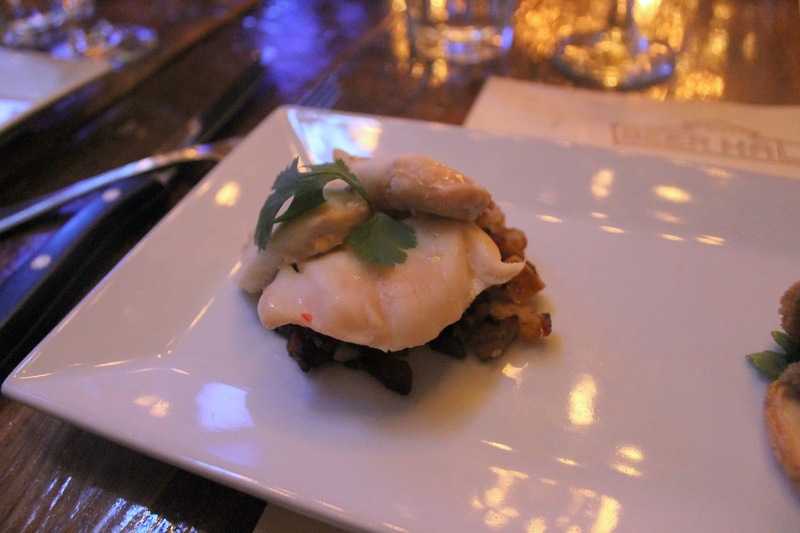 The mussels were paired with A Tiny Beautiful Something - Single hop American Pale Ale from Maine Beer Co.
Third Course: Poached monkfish cheeks with a salsify & bacon hash and fried monkfish liver. At this point in the evening the natural light was going away, so the photos are not as bright and cheery as I would have liked...my apologies! 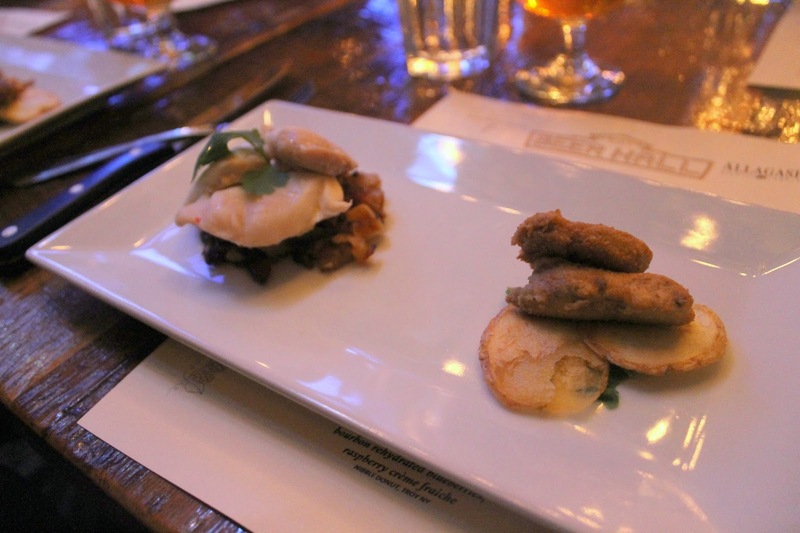 Maine Beer Co.'s West Coast style IPA, Lunch, was paired with the monkfish. 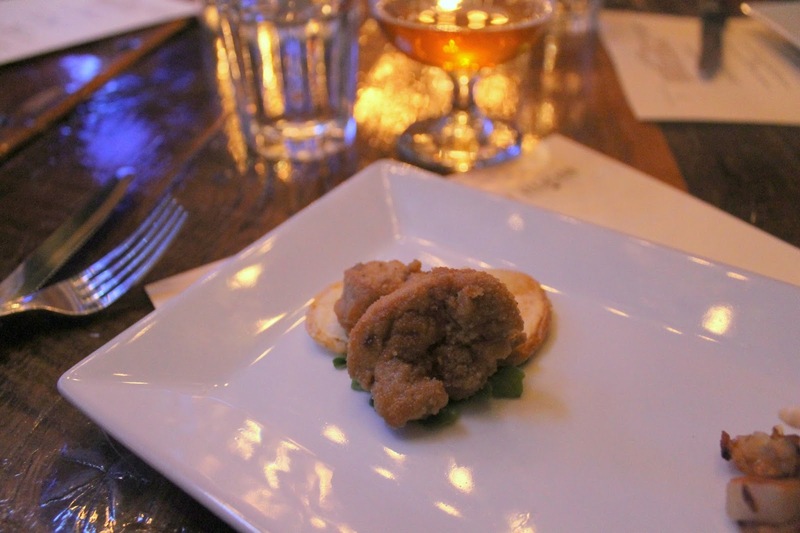 Ok, monkfish liver. I've never even thought about trying this, but let me tell you. I was pleasantly surprised when I paired it with the homemade potato chip. Dimitrios compared this to foie gras and I'd have to agree. 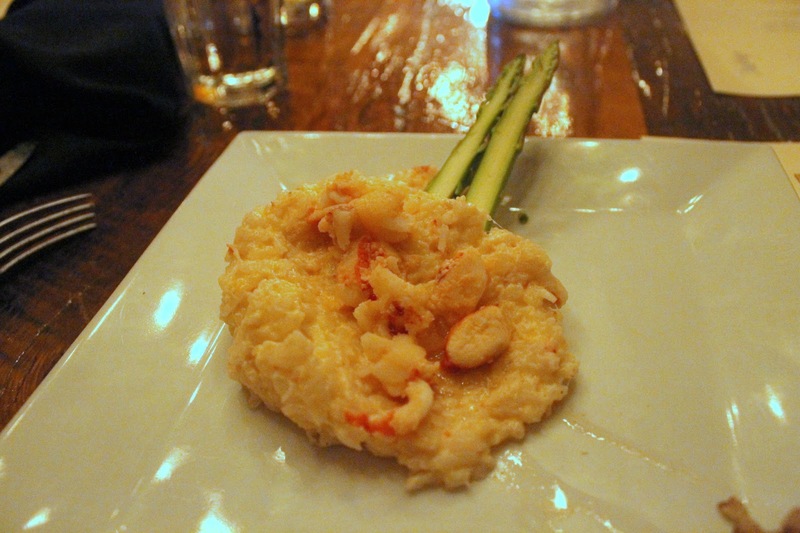 Fourth Course: Saffron lobster risotto with white chocolate, shaved asparagus, and black walnuts. 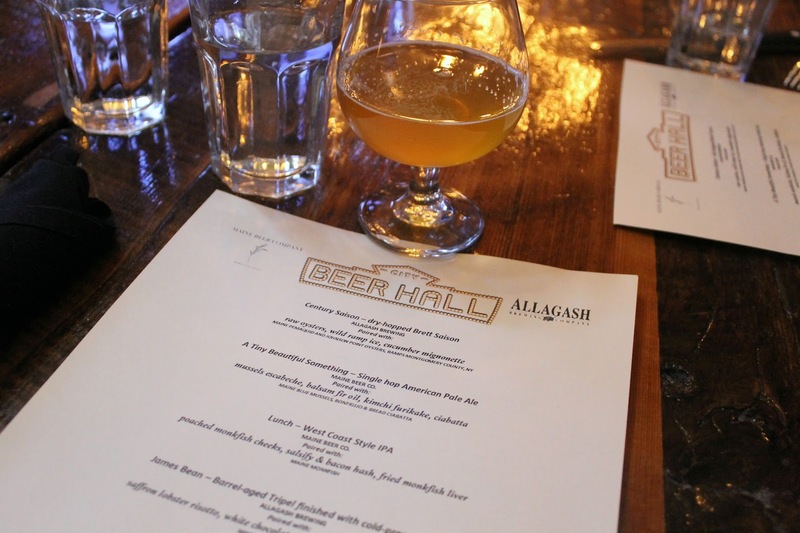 Allagash's Barrel-aged Tripel finished with cold-pressed coffee. I think this was the course where barely anyone was speaking, we were all too busy shoveling the risotto into our mouths. Um, yum! This risotto was fantastic! (I wish I had a bowl of it while I'm writing this post!) There was just a light dusting of the white chocolate on the risotto, but its such a fun idea and something I would have never thought to add to such a savory dish. 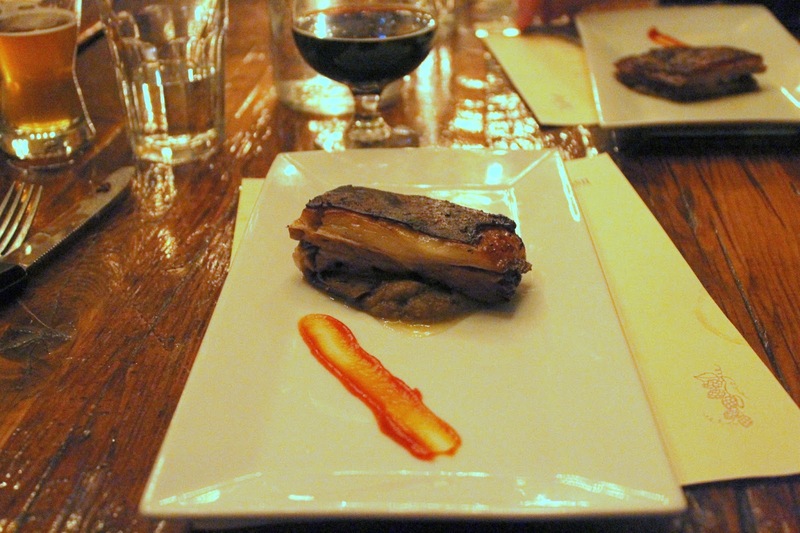 Fifth Course: Lamb belly confit on top a smoked eggplant puree and a bit of fried catsup on the side. 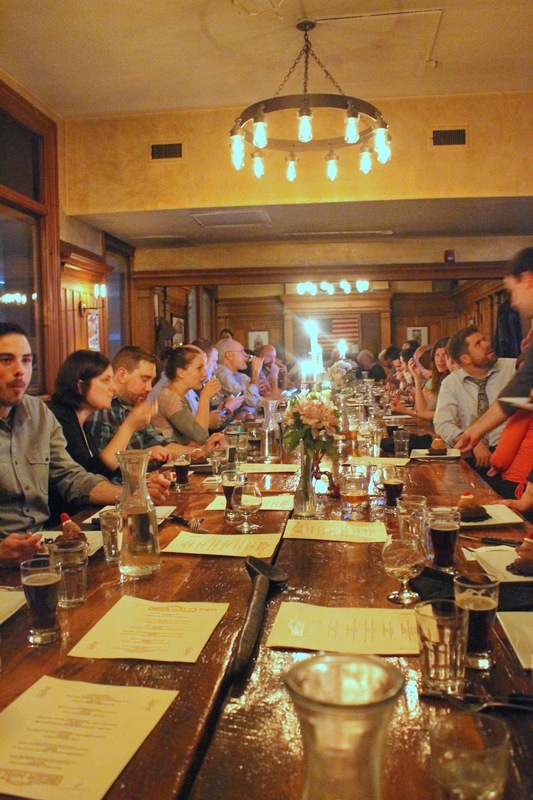 The lamb was paired with Maine Beer Co.'s King Titus, which is an American Robust Porter. 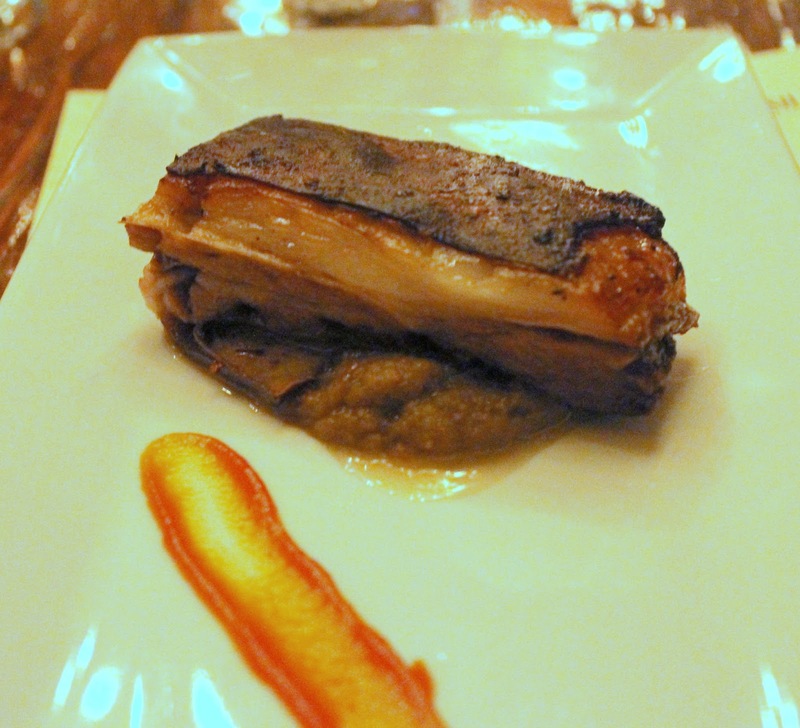 I've never had lamb belly before, but the flavor was great. It was a bit fatty, which is to be expected, but either way I really enjoyed it. The 'fried catsup' was a nice touch, too. Chef Dimitrios said he wanted it to resemble a BBQ sauce. 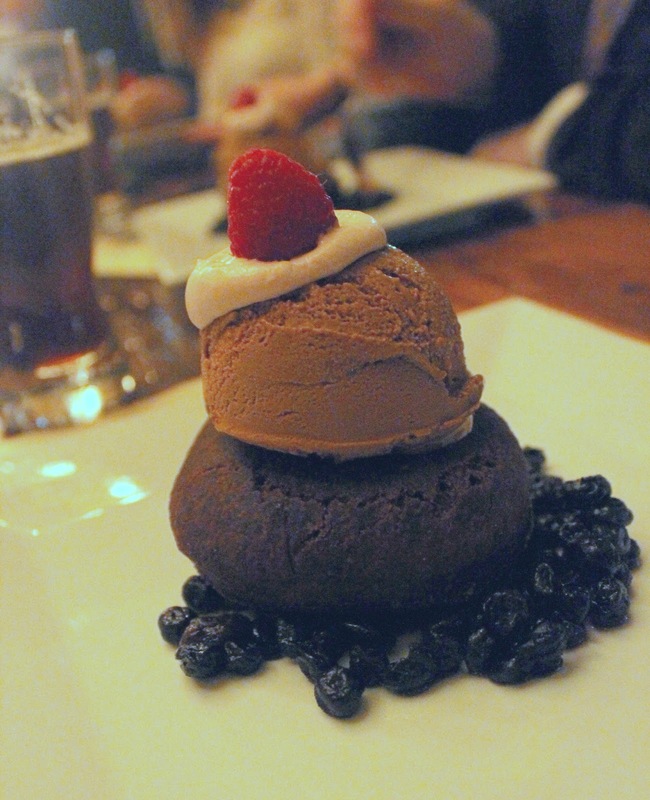 For dessert we were served a dark chocolate and sea salt donut, chocolate & chili ice cream, bourbon rehydrated blueberries, and a raspberry creme fraiche. The donuts were from Nibble in Troy and Dimitrios made the ice cream homemade. 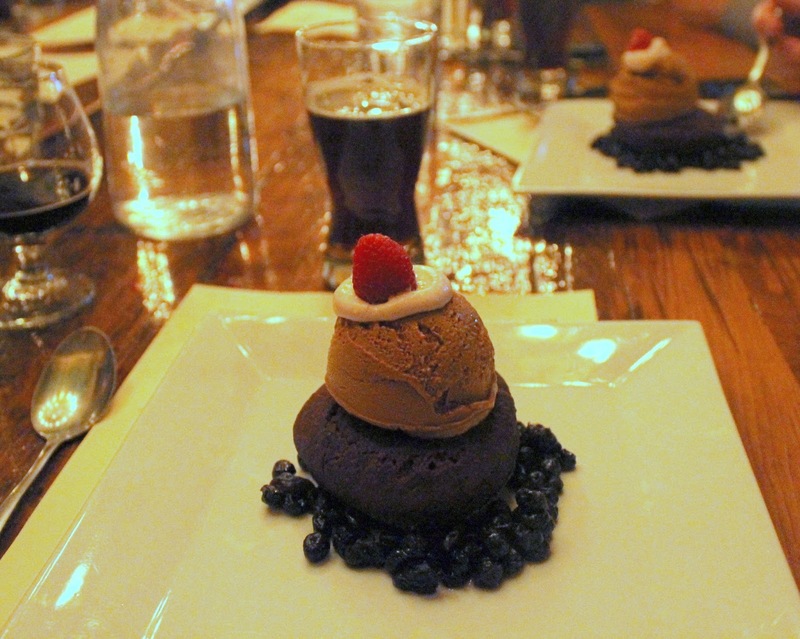 This dessert was a thing of beauty. Bourbon rehydrated blueberries are where it's at and I advise all of you to stop what you're doing, get in your kitchen, and make some to pour over a scoop of ice cream! 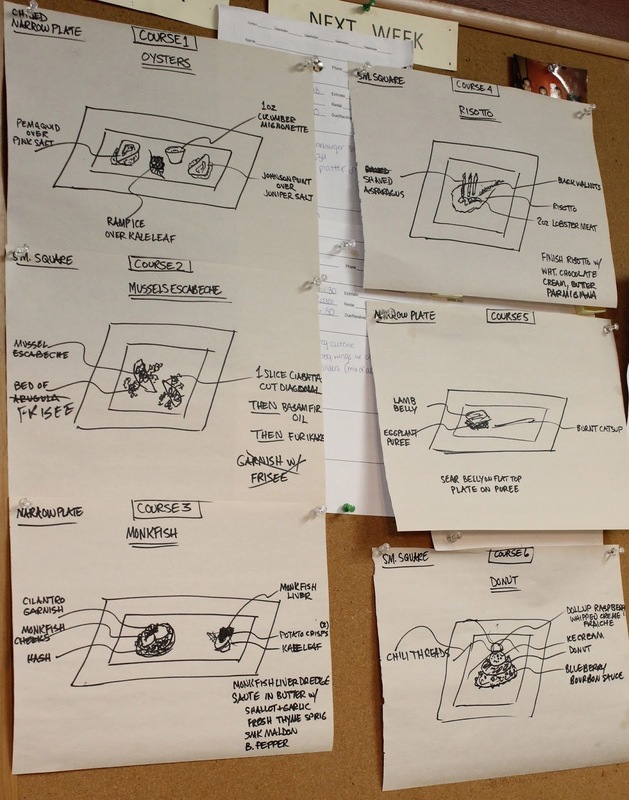 Before I left for the evening, Dimitrios invited me into the kitchen to snap a photo of the beer dinner's story board. It's neat to see his drawings go from a simple illustration to a wonderfully plated dish. Overall, The Maine Event was a wonderful evening. 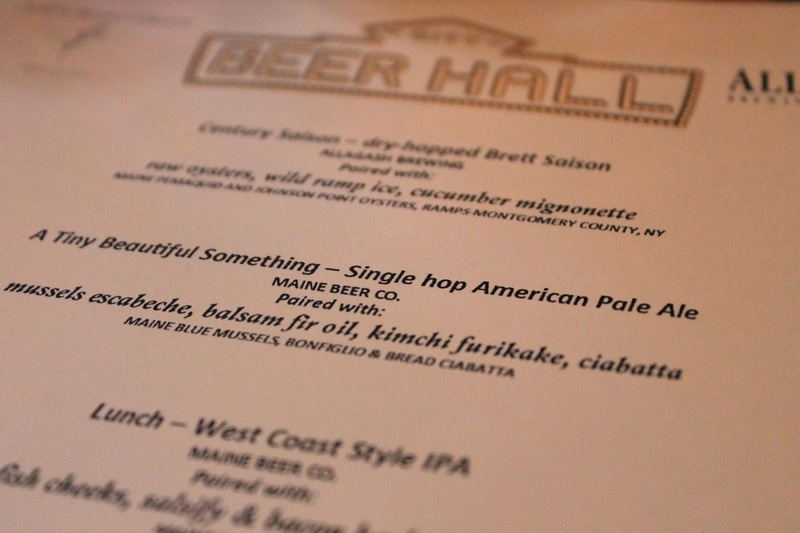 It's always fun to learn a little bit more about breweries and how some of the beers even got their name. 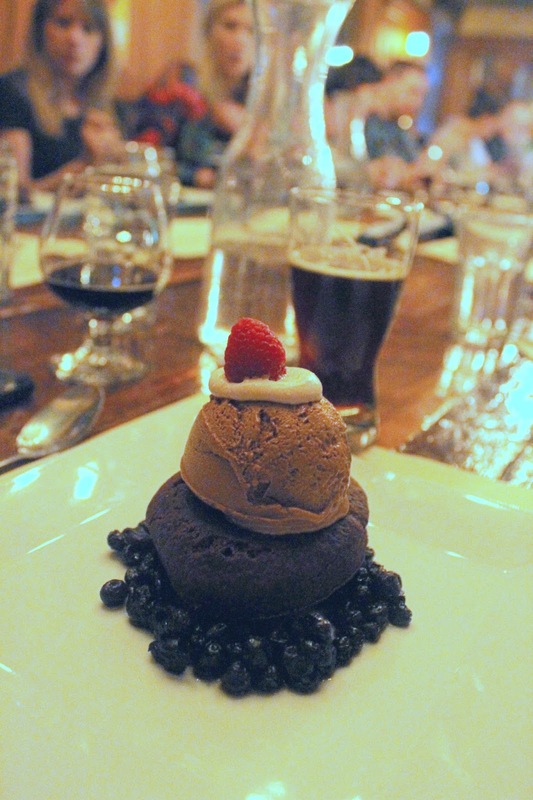 I think there is another beer dinner in June, so make sure you keep up with them on Facebook! Leave a comment below and let me know which of the six courses do you think you'd like to try most? 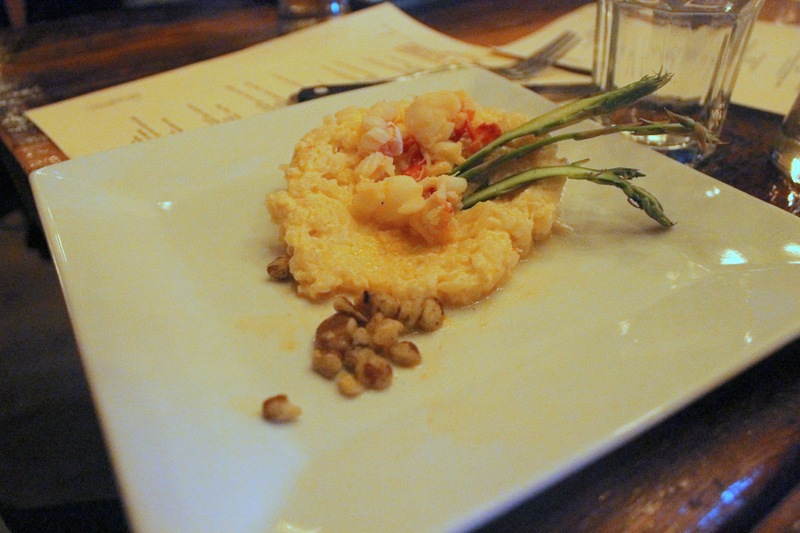 The all sound delicious.... but the lobster risotto- oh my! I'd love to try that!